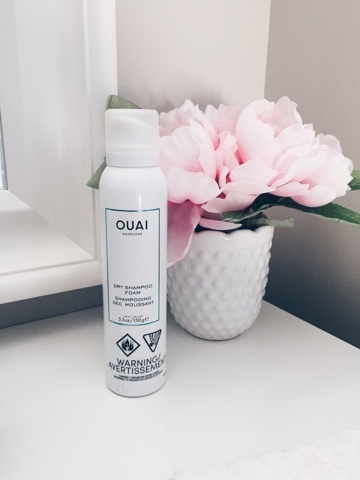 For months now I've been hearing/reading great reviews about this Dry Shampoo Foam by Ouai. Being a huge fan of dry shampoos, I had to give it a try. I purchased it as soon as it came out at Sephora for $35. I watched a few videos on how to actually work with the foam shampoo before attempting it on myself. So the first time I tried it, I will admit it did give me some volume. But it didn't look like I just had a fresh blow out. My roots still looked greasy, no matter how much product I kept adding in. I really wanted to love this product so I gave it another try and unfortunately had the same results. I even tried blow drying my hair afterwards. I don't know, maybe it's just blonde hair. The reviews I watched were all brunette women. Anyways, I thought I would be totally honest in case you really wanted to try this product. I've talked about my favorite dry shampoo here. And it's under $15, so check it out if you're interested.